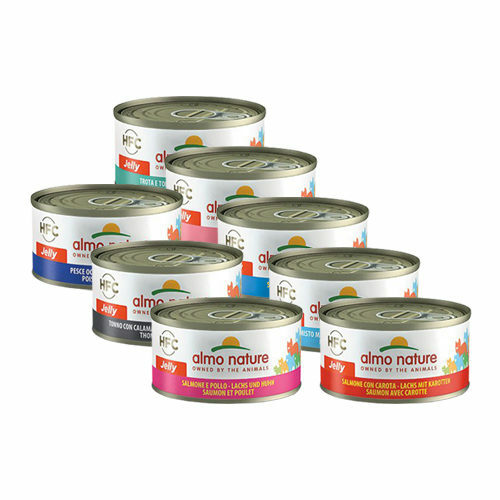 Almo Nature - Cat - HFC 70 Jelly consist of meat or fish in jelly for cats and only use natural ingredients. Almo Nature - Cat - HFC 70 Jelly is a wet food that comes in different variations and consists of 55% fish or meat, cooking stock and 1% rice. The meat is preserved in the cooking stock, thus helping store all of the micro nutrients. The ingredients of this food are suitable for human consumption. This way you are certain that your cat gets the best food available. Have you used Almo Nature - Cat - HFC 70 Jelly before? Let us know what you think about this product.